1دانش‌آموخته رشته زیست‌شناسی سلولی تکوینی، دانشگاه پیام نور، گروه علمی زیست‌شناسی، تهران، ایران. 2استاد رشته زیست‌ شناسی علوم جانوری و جنین‌شناسی، گروه زیست‌شناسی دانشکده علوم، دانشگاه فردوسی مشهد، ایران. 3استادیار رشته ژنتیک، گروه زیست‌شناسی، دانشگاه آزاد اسلامی واحد مشهد، ایران. 4دانشجوی دکتری رشته مهندسی کشاورزی، دانشگاه پیام نور، گروه علمی کشاورزی، تهران، ایران. 5دانشجوی دکتری بوم‌شناسی زراعی(اگرواکولوژی)،پردیس بین الملل دانشگاه فردوسی مشهد - گروه علمی کشاورزی،دانشگاه پیام نور،ایران. زعفران (Crocus sativusL. )، گیاه بومی کشور ایران و خصوصاً منطقه خراسان هست و دارای جایگاه خاصی در الگوی تغذیه مردم می‌باشد. با توجه به مطالعات متعدد اثرات زعفران و ازآنجاکه در زمینه‌ی اثرات آن بر روند تکوین مگس سرکه به‌عنوان یک مدل جانوری مطالعات خاصی صورت نگرفته، در این مطالعه اثرات عصاره آبی زعفران بر درصد تبدیل لارو به شفیره و شفیره به بالغ در مگس سرکه‌ در حین تکوین، مورد بررسی قرار گرفت. تعداد 5 جفت مگس سرکه وحشی بالغ سه‌روزه جهت جفت‌گیری و تخم‌گذاری به هر یک از ظروف کشت حاوی غلظت‌های متفاوت عصاره آبی زعفران منتقل و پس از هشت ساعت خارج گردیدند. درصد تبدیل لارو به شفیره و شفیره به بالغ در کلیه غلظت‌ها موردبررسی قرار گرفت. تجزیه‌وتحلیل‌های آماری با نرم‌افزار SAS و میانگین داده‌ها با آزمون Tukeyبا حداقل سطح معنی‌داری (p<0.05) مقایسه شدند. در غلظت‌های پایین‌تر زعفران، افزایش معنی‌دار میزان تبدیل لارو به شفیره در مقایسه با گروه کنترل، مشاهده شد. اما حضور غلظت‌های بالای زعفران در محیط کشت، منجر به کاهش معنی‌دار درصد تبدیل لارو به شفیره و شفیره به بالغ گردید. با توجه به نتایج به‌دست‌آمده اثرات زعفران بر روند تکوین مگس سرکه تا حدی وابسته به دوز عمل می‌کند. به این معنا که زعفران در غلظت‌های پایین اثرات مثبتی بر درصد تبدیل لارو به شفیره و شفیره به بالغ داشته ولی افزایش غلظت‌های مصرفی می‌تواند منجر به بروز تأثیر منفی بر این روند گردد. 4Ph.D Student of Agriculture, Agriculture Department, Payame Noor University, 19395-4697 Tehran, I. R. of IRAN. 5PhD Student of Agroecology, Ferdowsi University of Mashhad, International Campus -Department of Agriculture, Payame Noor University, I.R of IRAN. Saffron (Crocus sativusL. ), a native plant from Iran and especially of Khorasan region, has a specific place for people's diet. According to several studies about effects of saffron and because there are no specific studies on the effects of saffron aqueos extract on the development of Drosophila melanogaster as an animal model, this subject evaluated in conversion of larvae to pupa and pupa to mature of fruit flies. 5 pairs of 3-day-old wild D. melanogaster were transferred to every culture plate containing different concentrations of saffron aqueos extract in order to intercross and oviposition and were brought out after 8 hrs. The percent of larvae to pupa transitionand pupa to mature conversion, were evaluated in all concentrations. The obtained data were evaluated statistically using SAS software and the mean of data were compared using Tukey test with minimum significance level of pD. elanogaster depends on dose proportionately. It means that saffron has some effects on the percentage of conversion of larvae to pupa, pupa to mature in low volumes and increased consuming concentrations of saffron may have inverse effects on that. Abdullaev, F.I. 2002. Cancer chemopreventive and tumoricidal properties of saffron (Crocus sativusL). Experimental Biology and Medicine 227: 20. Abdullaev, F.I. 2003. Use of in vitro assays to assess the potential antigenotoxic and cytotoxic effects of saffron (Crocus sativus L.). Toxicology in vitro 17 (5-6): 751. Abdullaev, F.I., Gonzalez, D., and Mejia, E. 1995. Inhibition of colony formation of Hela cells by naturally occurring and synthetic agents. Biofactors 96: 133-138. AL-Momani, F.A., and Massadeh, A.M. 2005. Effect of different heavy-metal concentrations on Drosophila melanogaster larval growth and development. Bioligical Trace Element Research 108: 271-277. Aung, H.H., Wang, C.Z., Ni, M., and Fishbein, A. 2007. Crocin from Crocus sativus possesses significant anti-proliferation effects on human colorectal cancer cells. Experimental oncology 29 (3): 175-180. Das, I., Das, S., and Saha, T. 2010. Saffron suppresses oxidative stress in DMBA- induced skin carcinoma, A histopathological study. Acta Histochemic.a 112: 317-327. Edge, R., Mcgarvey, D.J., and Truscott, T.G. 1997. The carotenoids as anti-oxidants-a review. Journal of Photochemistry and Photobiology B 41 (3): 189-200. Escribano, J., Diaz-Guerra, J.M.M., Riese, H.H., and Ontanon, J. 1999. In vitro activation of macrophages by a novel proteoglycan isolated from corms of Crocus sativus L. Cancer Letters 144: 107-114. Fatehi, M., Rashidabady, T., and Fatehi-Hassanabad, Z. 2003. Effects of Crocus sativus petals’extract on rat blood pressure and on responses induced by electrical field stimulation in the rat isolated vas deferens and guinea-pig ileum. Journal of Ethnopharmacology 84: 199-203. Feizzadeh, B., Tavakkol Afshari, J., Rakhshandeh, H., Rahimi, A., and Brook, A. 2008. 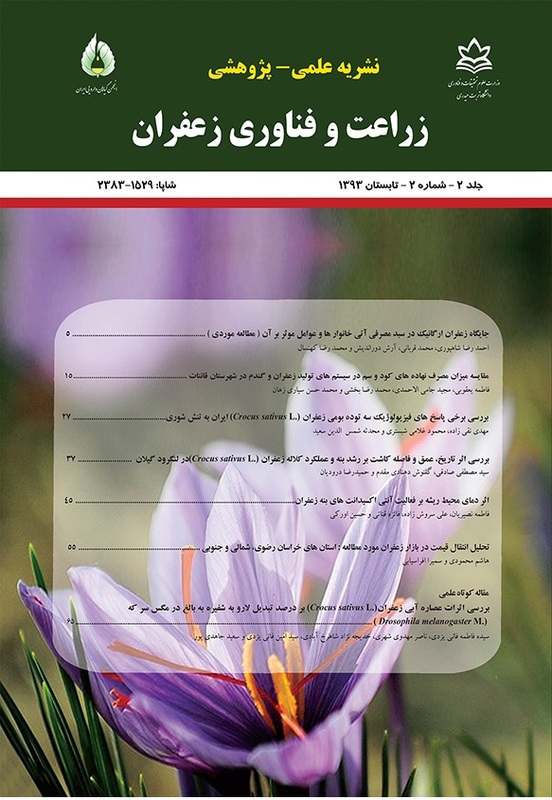 Cytotoxic effect of saffron stigma aqueous extract on human transitional. Cell Carcinoma and Mouse Fibroblast Urol Journal 5:161-167. Garcia-Olmo, D.C., Riese, H.H., Escribano, J., Ontanon, J., and Fernandez, J.A. 2011. Effects of long-term treatment of colon adenocarcinoma with crocin, a carotenoid from saffron (Crocus sativus L.): an experimental study in the rat. Nutrition and Cancer 35 (2): 120-126. Gout, B., Bourges, C., and Dubreuil, S.P. 2010. Satiereal, a Crocus sativus L extract, reduces snacking and increases satiety in a randomized placebo-controlled study of mildly overweight, healthy women. Nutrition Research 30: 305–313. Goyal, S.N., Arora, S., Sharma, A.K., and Joshi, S. 2010. Preventive effect of crocin of Crocus sativus on hemodynamic, biochemical, histopathological and ultra structural alterations in isoproterenol-induced cardiotoxicity in rats. Phytomedicine 17: 227–232. Hosseini, S.M., Dashti, M.H., Anvari, M., Zeinali, F., and Miresmaeili, S.M. 2009. Studying teratogenic and abortificant effects indifferent doses of saffron (Crocus sativus L.) decoction in 1st or 2nd trimesters in mice. Iranian Journal of Reproductive Medicine 7: 2- 35. Hosseinzadeh, H., and Younesi, H.M. 2002. Antinociceptive and anti-inflammatory effects of Crocus sativus L. stigma and petal extracts in mice. BMC Pharmacology 2: 147-155. Hosseinzadeh, H., Ziaee, T., and Sadeghi, A. 2008. The effect of saffron, Crocus sativus stigma, extract and its constituents, safranal and crocin on sexual behaviors in normal male rats. Phytomedicine 15: 491–495. Nair, S.C., Salomi, M.J., Varghese, C.D., Panikkar, B., and Panikkar, K.R. 1992. Effect of saffron on thymocyte proliferation, intracellular glutathione levels and its antitumor activity. Biofactors 4 (1): 51-54. Nezhad Shahrokhabadi, K.H., Tavakol Afshari, J., Rakhshandeh, H., and Borouk, A. 2009. Study of cytotoxicity effect of total saffron extract on hepatocarcinoma cell line (HepG2). Medical sciences journal of Islamic Azad University 19: 154-159. Palozza, P., and Krinsky, N.I. 1992. Antioxidant effects of carotenoids in vivo and in vitro: an overview. Methods in Enzymology 213: 403-420. Pitsikas, N., Boultadakis, A., Gergiadou, G., and Tarantilis, P.A. 2008. Effects of the active constituents of Crocus sativus L. in an animal model of anxiety. Phytomedicine 15: 1135-1139. Premkumar, K. 2003. Protective effects of saffron (Crocus sativus L.) on genotoxininducedoxidative stress in Swiss albino mice. Phytotherapy Research 17 (6): 614-617. Rios, J.L., Recio, M.C., Giner, R.M., and Manez, S. 1996. An update review of saffron and its active constituents. Phtotherapy Research 10: 189-193. Salomi, M.J., Nair, S.C., and Panikkar, K.R. 1991. Inhibitory effects of Nigella sativa and saffron (Crocus sativus) on chemical carcinogenesis in mice. Nutrition in Cancer 16 (1): 67-72. Sang, J.H. 1956. The quantitative nutritional reqirements of Drosophila melanogaster. Journal of Experimental Biology 33: 45-72. Tafazoli, M., Kermani, T., and Saadatjoo, A.R. 2004. Effects of saffron on abortion and its side effect on mice balb/c. Ofogh-e- danesh, Journals of University of Medical Sciences and Health Services 10: 52-55. Takashi, O., Hiroshi, S., Ken-ichi, M., and Katsunori, I. 2007. Protective effects of carotenoids from saffron on neuronal injury in vitro and in vivo. Biochimica ET Biophysica Acta 1770: 578–584. Tickoo S., and Russell S. 2002. Drosophila melanogaster as a model system for drug discovery and pathway screening. Current Opinion in Pharmacology 2: 555–560. Wilkinson, J.A., and Wahlqvist, M.L. 2002. New food and pharmaceutical products from agriculture, Rural Industries Research and Development Corporation (RIRDC), Available at https://rirdc.infoservices.com.au/downloads/02-015 (accessed February 2002).